I never thought I would ever make them myself. They were my aunt’s “thing” — my parents left them to her to make and we enjoyed a generous batch whenever she did–perhaps that added to their mystique, somehow. But what mystique? We’re talking about the equivalent of a pancake. Just with that beautiful, lacy crust around the edges, a result of the special pan used to make them, which also allowed the batter to pool in the centre and set to a thick, soft pillow there. 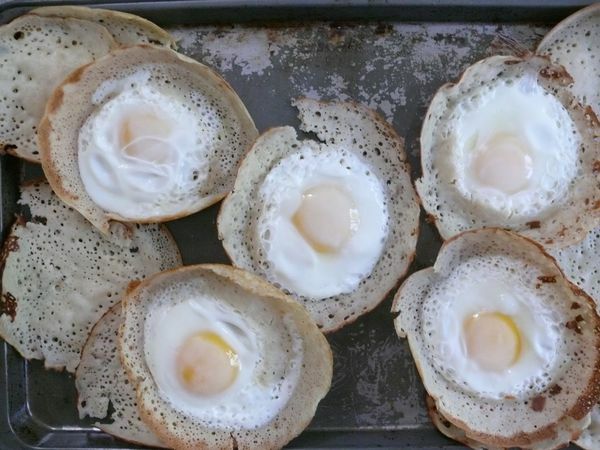 A pillow that cradles a softly poached egg–the milkiest egg you’ve ever cooked. Ok, I see it now. These will always be a little magical to me, though no longer mysterious. The batter is very much like a pancake batter. This one simply uses rice flour and sits covered overnight. 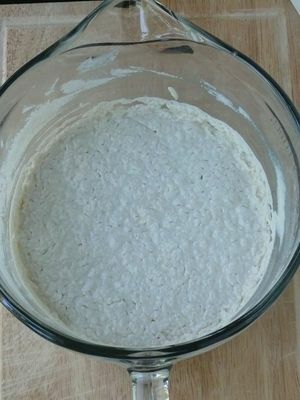 And overnight, it ferments, giving hoppers their slightly complex but subtle, bread-y flavour. 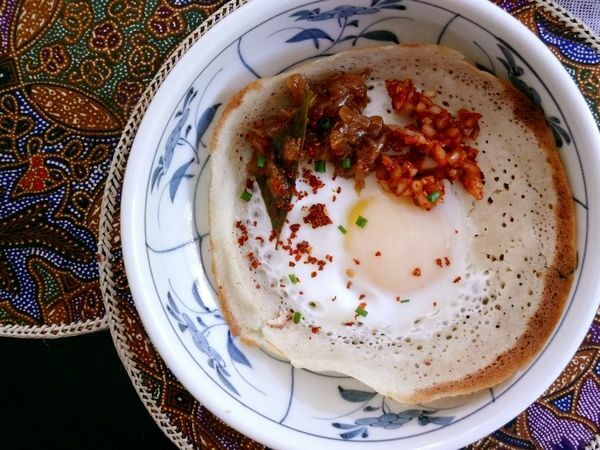 Hoppers are typically served with sides (*see below) that can be made in batches ahead of time, even frozen, or you could serve them with store-bought sambols or chutneys. 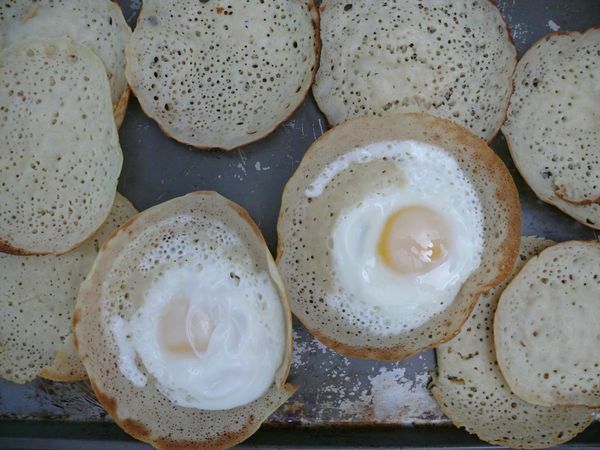 In any case, you could have hoppers for breakfast within minutes if you stir the quick batter together before going to bed. Hopper pans are so small, lightweight and affordable that they would be worth adding to your already-packed kitchen (see my post about hopper pans), and the delicate crust that forms at the edges of hoppers are the reason to buy the pan. 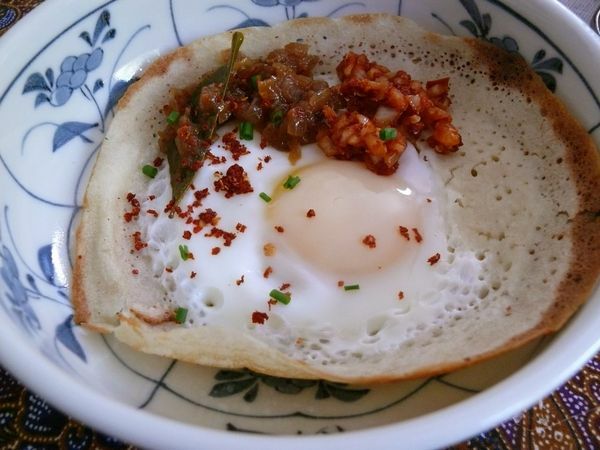 It allows them to get thin, cook until golden, so crisp it can shatter at the outermost tip, while the centre remains fluffy, thick and sturdy enough to handle a dip in a warm, golden egg yolk and through some sambol and curry. While creating a cradle for the egg and achieving those edges is harder without a hopper pan, please don’t let not having one stop you. 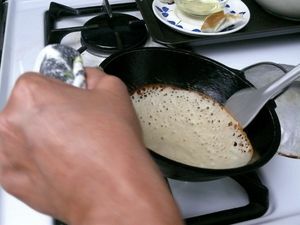 Use your smallest, ideally high-sided and seasoned (or non-stick) pan, and try is to swirl the batter all around and up the sides immediately, to hopefully achieve a thinner and crisper edge than centre. As for the egg itself, it’s a slightly firmer version of a soft-boiled egg laid out flat like a fried egg—the best of both those worlds. A warm golden centre but also the milkiest whites ever. UPDATE! Aug 31, 2015: I have cooked with my mom & aunt for years but they are always teaching me. The latest, mind-blowing (to me) tip, they taught me as we made hoppers together in my house this past summer. 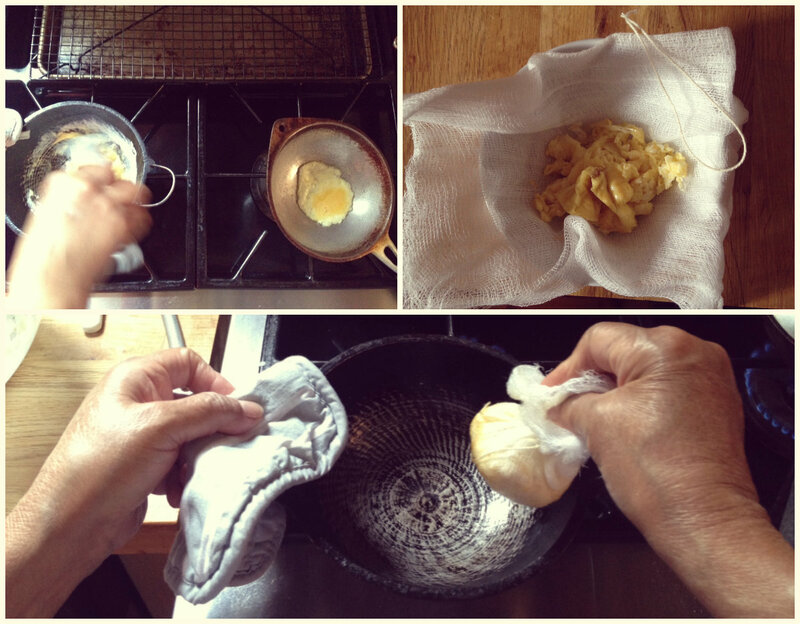 They seasoned the pan dozens of times with a single fried egg in cheesecloth, instead of oil! 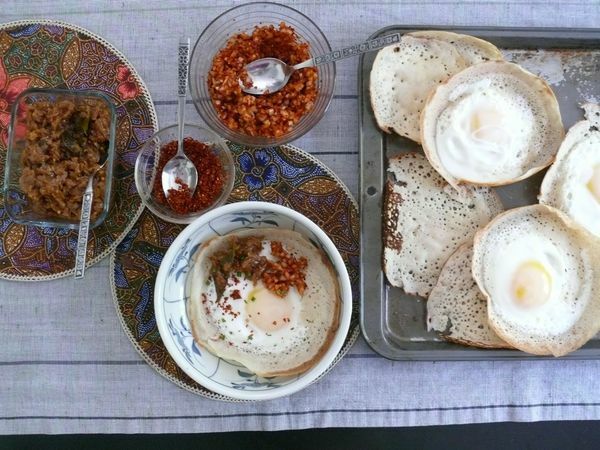 They cracked an egg into a bowl, then broke it a little and poured half of the egg into each of two dry hopper pans heating up on the stove. 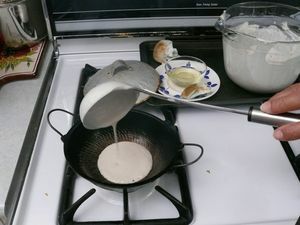 They scrambled the egg in the pan, letting the egg touch all parts of the inside, then scrapped all of the egg out into a small bowl, double-lined with some cheese cloth. 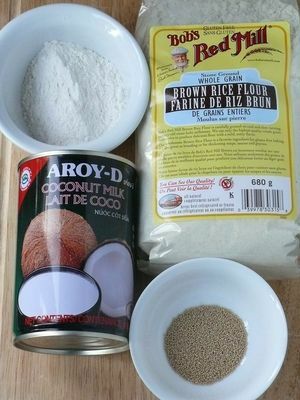 They tied it up and then wiped the pans with this little bundle, before adding batter each time. It worked as well as oil, which is to say, perfectly, without the use of any oil. This would work with pancakes but who knows what else—I imagine fritters too, maybe more. Pictures of my mom in action below to help you try this out! Love, love, loooooooove this. I have no idea when I’ll drum up the courage to make it but one day, I will. you will master it, heather! Where does one buy hopper pans? “little india” if you’re lucky enough to have such a neighbourhood close to where you live. south asian housewares stores carry them and it seems you can order them online. Looks delicious can’t wait to try! Noticed you had two types of pans – which one would you recommend to use the single handed one of the double handed one? Double-handed makes it easier to swirl evenly but single will do!